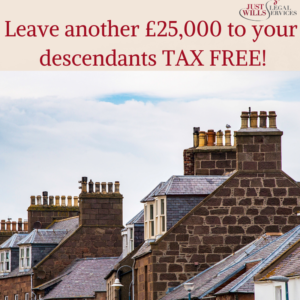 …the start of the new tax year, the residence nil rate band (RNRB) threshold increases by £25,000 per person, increasing it to £150,000 which can be added to your personal IHT threshold of £325,000 to be left, tax-free to your descendants. This extra £150,000 only applies If part of your estate being bequeathed is your residence and is been left to a direct descendant i.e. a child (including a step-child, adopted child or foster child) and their lineal descendants. Inheritance Tax is a tax charged at usually 40% on any part of your estate that exceeds your personal allowance of £325,000. This Inheritance Tax threshold (the amount you can leave to anyone tax-free) has been frozen until the tax year 2020/21. So, the thresholds of £325,000 pp or £650,000, if the deceased’s IHT threshold is passed onto the remaining spouse, will apply to deaths from 6 April 2009 – 5 April 2021. Just as the existing nil-rate band unused by a spouse can be transferred to the surviving spouse, doubling their IHT threshold so can the residence nil rate Band – ultimately meaning a widow/widower could leave their descendants up to £1,000,000 tax-free after 5th April 2020. (see the table below). The Residence Nil Rate band threshold will increase by £25k pp. For larger estates the allowance is tapered, reducing by £1 for every £2 that the estate is valued at over £2m. If you would like to know more about Inheritance Tax planning or making your Will, get in touch with us at Just Wills and Legal Services 01342 477102 to book a free consultation. This article has been provided by Just Wills & Legal Services Ltd one of the leading home visit Wills, Estate Planning and Probate services in the country.